We had a great weekend in the workshop with Lorraine, Rena and Fran each producing some very effective carving. A bit of autumnal sunshine helped and the woods are starting to look spectacular with the autumn colours coming through. Rena and Fran are experienced wood carvers and found their skills transferred well to working in stone. Rena is an ex-soldier and she made a wreath design encircling a canine paw print, which reflects her membership of the Army Dog Corps. The work on the paw print is crisp and precise and it was great to see a project with strong personal meaning come to life. 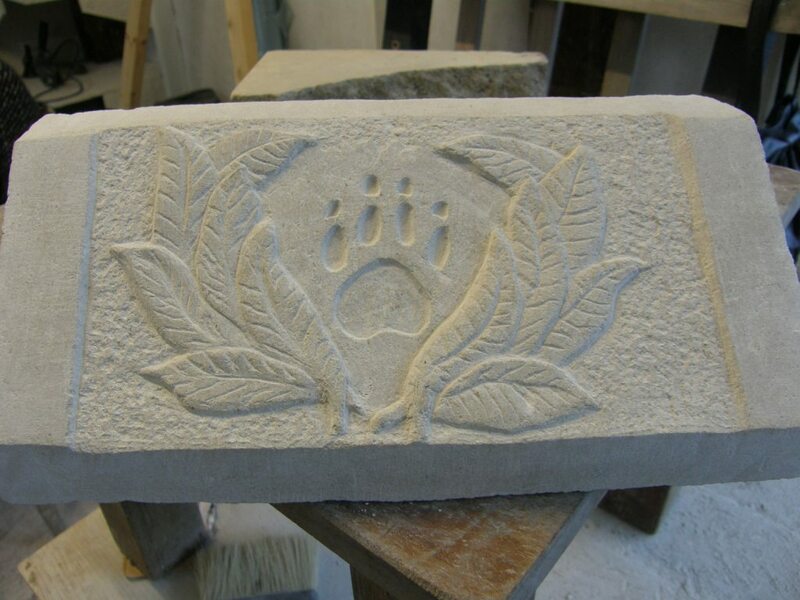 Fran made a carving of ivy and ferns creeping over a boulder. The design worked really well and there is scope for Fran to add to it at home, she’s hoping to invest in some stone chisels once Christmas is out of the way! Lorraine has attended a stone carving workshop once before and has some tools – she made excellent progress on her tudor rose design and we are hoping to get a photo of the finished article before too long. Thanks to this weeks students for their hard work and good company. There are more photos from the weekend here.